Do you know many manufacturers that have accumulated prizes, awards, trophies and recognitions as much as Meryl Streep collects Oscars? Of course not! Mazda is without a doubt the manufacturer that is most successful at injecting all its vehicles with this particular shot of adrenaline which translates into driving dynamics that are second to none. Besides, there is no denying the specialists’ opinions and comments, and when comes the time to select a vehicle, no matter where you live, we very often rely on their undeniable expertise. The automotive journalists from the Car Guide have named 4 of the 2018 Mazda models as “Best Buys”. These were the Mazda3 in the Compact Cars class, the Mazda CX-3 in the Subcompact SUVs class, the Mazda CX-5 in the Compact SUVs under $40,000 class and the sublime and exciting MX-5 in the Convertibles and Roadsters under $50,000 class. The Protégez-vous magazine also asserted about Mazda vehicles that their reliability was above average. In addition, the IIHS (Insurance Institute for Highway Safety) awarded its highest distinction (Top Safety Pick) to the following models; the CX-3, the CX-5, the CX-9, the Mazda6 and the Mazda3. This recognition speaks volumes, doesn’t it? The 2018 CX-5 features among the 3 finalists for the title of World Car of the Year, according to the World Car Awards. The WCA is an international non-profit association composed of several renowned automotive journalists, 48 in all, from Asia, Europe and North America. Being in the world’s Top 3 is truly amazing, admit it! 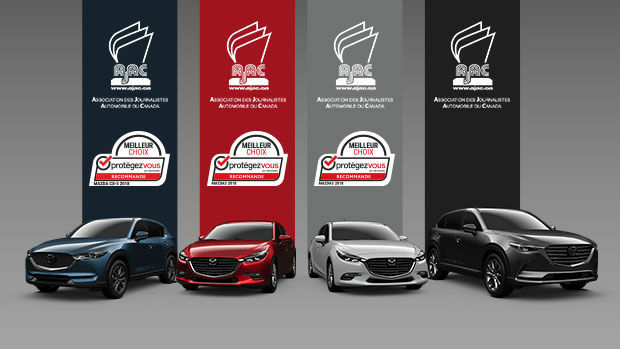 Following this… yes, we are still not done, the AJAC (Automobile Journalists Association of Canada) has made Mazda the most rewarded brand in 2018. Indeed, the 2018 Mazda CX-5 was named Best Small Utility Vehicle in Canada for 2018, the 2018 Mazda3 and Mazda3 Sport were named Best Small Cars in Canada for 2018, and the 2018 Mazda CX-9 was awarded the title of Best Large Utility Vehicle in Canada for 2018. In order to choose which will be yours among all these worthy representatives, drop by your Mazda Spinelli dealership in Lachine. Not only will you be able to take advantage of the Mazda unlimited mileage warranty, but also from Mazda promotions and of course, Mazda financing.